DAVID BEN-GURION. Letter Signed to Menasche Elissar. 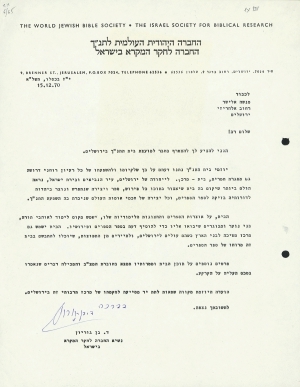 17 Kislev 5731, December 15, 1970. 1 p., 8½ x 11 in. Form letter on “The World Jewish Bible Society” letterhead. In Hebrew. Also see item #22355, where Ben Gurion reexamines a Bible story after discussion with the chairman of the World Jewish Bible Society. I would invite you to become a member of the council of the Bible House in Jerusalem. The proponents of the Bible House have given consideration to the fact that every spiritual idea, for it to exist and exert influence, needs a physical structure, too, a central home. The uniqueness of Jerusalem, the city of the prophets and the capital of Israel, makes it appropriate that a House be established in it to collect inside every commentary, book and creation that has been thought of and created in Judaism through the generations regarding the Book of Books, and every creation by the sages of the nations of the world that displays the influence of the Bible. The House, with its book collections and educational exhibits, will serve as a place of study for the lovers of Torah, the youth and adults who will come to it in order to increase their knowledge of the Book of Books and its interpretations. The House will also serve as a gravitational center for residents of this country when they go up to Jerusalem, and to tourists from the Diaspora, who will be able to absorb in it the spirit of the Book of Books. More details about the House’s content and its purpose can be found in the attached brochure, which contains things said during the ground breaking ceremony. The initiating committee hopes you will agree to lend a helping hand to the establishment of this cultural center in Jerusalem. Building a permanent home for the Israeli Center for Biblical Research was one of Ben-Gurion’s favorite projects. He envisioned a compound overlooking Jerusalem and the Mount of Olives with a research library, exhibit and museum space, and educational facilities. Intended for the study of the Hebrew Bible, the research center would be the headquarters for the World Jewish Bible Society. Ground was broken on October 18, 1970, but the building was never completed. David Ben-Gurion, Israeli politician; proclaimed Israeli independence in 1948, becoming the new independent nation’s first Prime Minister after years as the head of the Zionist movement; changed his name from Gryn to Ben-Gurion, “Son of the Lion Cub.” Even in retirement, Ben-Gurion’s crusade to strengthen and enrich the state and people of Israel did not end.